Sign up today to join the Urban Worm Network and get yourself on the map! Check out where your fellow the worm heads are located, worldwide! And find vendors close to you! *If you have any issues with signing up please e-mail me and I’ll get you taken care of. Are you interested in vermicomposting and vermiculture as a business? 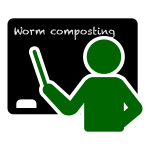 Are you interested in local vermicomposting and vermiculture groups or meetups? Are you interested in organic gardening?